This article may need to be cleaned up. It has been merged from Structural integrity and Structural failure. 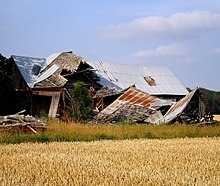 Collapsed barn at Hörsne, Gotland, Sweden. Structural integrity and failure is an aspect of engineering which deals with the ability of a structure to support a designed structural load (weight, force, etc...) without breaking, and includes the study of past structural failures in order to prevent failures in future designs. Structural integrity is the ability of an item—either a structural component or a structure consisting of many components—to hold together under a load, including its own weight, without breaking or deforming excessively. It assures that the construction will perform its designed function during reasonable use, for as long as its intended life span. Items are constructed with structural integrity to prevent catastrophic failure, which can result in injuries, severe damage, death, and/or monetary losses. Structural failure refers to the loss of structural integrity, or the loss of load -carrying capacity in either a structural component, or the structure itself. Structural failure is initiated when a material is stressed beyond its strength limit, causing fracture or excessive deformations; one limit state that must be accounted for in structural design is ultimate failure strength. In a well- designed system, a localized failure should not cause immediate or even progressive collapse of the entire structure. Structural integrity is the ability of a structure to withstand its intended loading without failing due to fracture, deformation, or fatigue. It is a concept often used in engineering to produce items that will serve their designed purposes and remain functional for a desired service life . To construct an item with structural integrity, an engineer must first consider a material’s mechanical properties, such as toughness, strength, weight, hardness, and elasticity, and then determine the size and shape necessary for the material to withstand the desired load for a long life. Since members can neither break nor bend excessively, they must be both stiff and tough. A very stiff material may resist bending, but unless it is sufficiently tough, it may have to be very large to support a load without breaking. On the other hand, a highly elastic material will bend under a load even if its high toughness prevents fracture. Furthermore, each component’s integrity must correspond to its individual application in any load-bearing structure. Bridge supports need a high yield strength, whereas the bolts that hold them need good shear and tensile strength. Springs need good elasticity, but lathe tooling needs high rigidity. In addition, the entire structure must be able to support its load without its weakest links failing, as this can put more stress on other structural elements and lead to cascading failures. The need to build structures with integrity goes back as far as recorded history. Houses needed to be able to support their own weight, plus the weight of the inhabitants. Castles needed to be fortified to withstand assaults from invaders. Tools needed to be strong and tough enough to do their jobs. However, the science of fracture mechanics as it exists today was not developed until the 1920s, when Alan Arnold Griffith studied the brittle fracture of glass. Starting in the 1940s, the infamous failures of several new technologies made a more scientific method for analyzing structural failures necessary. During World War II, over 200 welded-steel ships broke in half due to brittle fracture, caused by stresses created from the welding process, temperature changes, and by the stress concentrations at the square corners of the bulkheads. In the 1950s, several De Havilland Comets exploded in mid-flight due to stress concentrations at the corners of their squared windows, which caused cracks to form and the pressurized cabins to explode. Boiler explosions, caused by failures in pressurized boiler tanks, were another common problem during this era, and caused severe damage. The growing sizes of bridges and buildings led to even greater catastrophes and loss of life. This need to build constructions with structural integrity led to great advances in the fields of material sciences and fracture mechanics. Structural failure can occur from many types of problems, most of which are unique to different industries and structural types. However, most can be traced to one of five main causes. The first is that the structure is not strong and tough enough to support the load, due to either its size, shape, or choice of material. If the structure or component is not strong enough, catastrophic failure can occur when the structure is stressed beyond its critical stress level. The second type of failure is from fatigue or corrosion, caused by instability in the structure’s geometry, design or material properties. These failures usually begin when cracks form at stress points, such as squared corners or bolt holes too close to the material's edge. These cracks grow as the material is repeatedly stressed and unloaded (cyclic loading), eventually reaching a critical length and causing the structure to suddenly fail under normal loading conditions. The third type of failure is caused by manufacturing errors, including improper selection of materials, incorrect sizing, improper heat treating, failing to adhere to the design, or shoddy workmanship. This type of failure can occur at any time and is usually unpredictable. The fourth type of failure is from the use of defective materials. This type of failure is also unpredictable, since the material may have been improperly manufactured or damaged from prior use. The fifth cause of failure is from lack of consideration of unexpected problems. This type of failure can be caused by events such as vandalism, sabotage, or natural disasters. It can also occur if those who use and maintain the construction are not properly trained and overstress the structure. The Dee bridge was designed by Robert Stephenson, using cast iron girders reinforced with wrought iron struts. On 24 May 1847, it collapsed as a train passed over it, killing five people. Its collapse was the subject of one of the first formal inquiries into a structural failure. This inquiry concluded that the design of the structure was fundamentally flawed, as the wrought iron did not reinforce the cast iron, and that the casting had failed due to repeated flexing. 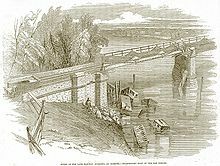 The Dee bridge disaster was followed by a number of cast iron bridge collapses, including the collapse of the first Tay Rail Bridge on 28 December 1879. Like the Dee bridge, the Tay collapsed when a train passed over it, killing 75 people. The bridge failed because it was constructed from poorly made cast iron, and because designer Thomas Bouch failed to consider wind loading on it. Its collapse resulted in cast iron being replaced by steel construction, and a complete redesign in 1890 of the Forth Railway Bridge, making it the first entirely steel bridge in the world. The 1940 collapse of the original Tacoma Narrows Bridge is sometimes characterized in physics textbooks as a classic example of resonance, although this description is misleading. The catastrophic vibrations that destroyed the bridge were not due to simple mechanical resonance, but to a more complicated oscillation between the bridge and winds passing through it, known as aeroelastic flutter. Robert H. Scanlan, father of the field of bridge aerodynamics, wrote an article about this misunderstanding. This collapse, and the research that followed, led to an increased understanding of wind/structure interactions. Several bridges were altered following the collapse to prevent a similar event occurring again. The only fatality was a dog named Tubby. Security camera images show the I-35W collapse in animation, looking north. The I-35W Mississippi River bridge (officially known simply as Bridge 9340) was an eight-lane steel truss arch bridge that carried Interstate 35W across the Mississippi River in Minneapolis, Minnesota, United States. The bridge was completed in 1967, and its maintenance was performed by the Minnesota Department of Transportation. The bridge was Minnesota's fifth–busiest, carrying 140,000 vehicles daily. The bridge catastrophically failed during the evening rush hour on 1 August 2007, collapsing to the river and riverbanks beneath. Thirteen people were killed and 145 were injured. Following the collapse, the Federal Highway Administration advised states to inspect the 700 U.S. bridges of similar construction after a possible design flaw in the bridge was discovered, related to large steel sheets called gusset plates which were used to connect girders together in the truss structure. Officials expressed concern about many other bridges in the United States sharing the same design and raised questions as to why such a flaw would not have been discovered in over 40 years of inspections. See also: the categories Building collapses and Collapsed buildings and structures. On 4 April 2013, a building collapsed on tribal land in Mumbra, a suburb of Thane in Maharashtra, India. It has been called the worst building collapse in the area[nb 1]: 74 people died, including 18 children, 23 women, and 33 men, while more than 100 people survived. The building was under construction and did not have an occupancy certificate for its 100 to 150 low- to middle-income residents ; its only occupants were the site construction workers and their families. The building was reported to have been illegally constructed because standard practices were not followed for safe, lawful construction, land acquisition and resident occupancy. By 11 April, a total of 15 suspects were arrested including builders, engineers, municipal officials, and other responsible parties. Governmental records indicate that there were two orders to manage the number of illegal buildings in the area: a 2005 Maharashtra state order to use remote sensing and a 2010 Bombay High Court order. Complaints were also made to state and municipal officials. On 9 April, the Thane Municipal Corporation began a campaign to demolish illegal buildings in the area, focusing on “dangerous” buildings, and set up a call center to accept and track the resolutions of complaints about illegal buildings. The forest department, meanwhile, promised to address encroachment of forest land in the Thane District. On 24 April 2013, Rana Plaza, an eight-storey commercial building, collapsed in Savar, a sub-district in the Greater Dhaka Area, the capital of Bangladesh. The search for the dead ended on 13 May with the death toll of 1,129. Approximately 2,515 injured people were rescued from the building alive. The building contained clothing factories, a bank, apartments, and several other shops. The shops and the bank on the lower floors immediately closed after cracks were discovered in the building. Warnings to avoid using the building after cracks appeared the day before had been ignored. Garment workers were ordered to return the following day and the building collapsed during the morning rush-hour. On 29 June 1995, the five story Sampoong Department Store in the Seocho District of Seoul, South Korea collapsed resulting in the deaths of 502 people, with another 1,445 being trapped. In April 1995, cracks began to appear in the ceiling of the fifth floor of the store's south wing due to the presence of an air-conditioning unit on the weakened roof of the poorly built structure. On the morning of 29 June, as the number of cracks in the ceiling increased dramatically, store managers closed the top floor and shut off the air conditioning, but failed to shut the building down or issue formal evacuation orders as the executives themselves left the premises as a precaution. Five hours before the collapse, the first of several loud bangs was heard emanating from the top floors, as the vibration of the air conditioning caused the cracks in the slabs to widen further. Amid customer reports of vibration in the building, the air conditioning was turned off but, the cracks in the floors had already grown to 10 cm wide. At about 5:00 p.m. local time, the fifth floor ceiling began to sink, and at 5:57 p.m., the roof gave way, sending the air conditioning unit crashing through into the already-overloaded fifth floor. On 16 May 1968, the 22-story residential tower Ronan Point in the London Borough of Newham collapsed when a relatively small gas explosion on the 18th floor caused a structural wall panel to be blown away from the building. The tower was constructed of precast concrete, and the failure of the single panel caused one entire corner of the building to collapse. The panel was able to be blown out because there was insufficient reinforcement steel passing between the panels. This also meant that the loads carried by the panel could not be redistributed to other adjacent panels, because there was no route for the forces to follow. As a result of the collapse, building regulations were overhauled to prevent disproportionate collapse and the understanding of precast concrete detailing was greatly advanced. Many similar buildings were altered or demolished as a result of the collapse. On 19 April 1995, the nine-story concrete framed Alfred P. Murrah Federal Building in Oklahoma was struck by a huge car bomb causing partial collapse, resulting in the deaths of 168 people. The bomb, though large, caused a significantly disproportionate collapse of the structure. The bomb blew all the glass off the front of the building and completely shattered a ground floor reinforced concrete column (see brisance). At second story level a wider column spacing existed, and loads from upper story columns were transferred into fewer columns below by girders at second floor level. The removal of one of the lower story columns caused neighbouring columns to fail due to the extra load, eventually leading to the complete collapse of the central portion of the building. The bombing was one of the first to highlight the extreme forces that blast loading from terrorism can exert on buildings, and led to increased consideration of terrorism in structural design of buildings. The Versailles wedding hall (Hebrew: אולמי ורסאי‎), located in Talpiot, Jerusalem, is the site of the worst civil disaster in Israel's history. At 22:43 on Thursday night, 24 May 2001 during the wedding of Keren and Asaf Dror, a large portion of the third floor of the four-story building collapsed. In the September 11 attacks, two commercial airliners were deliberately crashed into the Twin Towers of the World Trade Center in New York City. The impact and resulting fires caused both towers to collapse within less than two hours. The impacts severed exterior columns and damaged core columns, redistributing the loads that these columns had carried. This redistribution of loads was greatly influenced by the hat trusses at the top of each building. The impacts dislodged some of the fireproofing from the steel, increasing its exposure to the heat of the fires. Temperatures became high enough to weaken the core columns to the point of creep and plastic deformation under the weight of higher floors. The heat of the fires also weakened the perimeter columns and floors, causing the floors to sag and exerting an inward force on exterior walls of the building. WTC Building 7 also collapsed later that day; the 47 story skyscraper collapsed within seconds due to a combination of a large fire inside the building and heavy structural damage from the collapse of the north tower. A 1964 B-52 Stratofortress test demonstrated the same failure that caused the 1963 Elephant Mountain & 1964 Savage Mountain crashes. 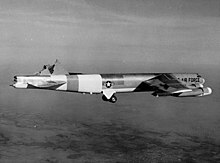 Repeated structural failures of aircraft types occurred in 1954, when two de Havilland Comet C1 jet airliners crashed due to decompression caused by metal fatigue, and in 1963-64, when the vertical stabilizer on four Boeing B-52 bombers broke off in mid-air. On 8 August 1991 at 16:00 UTC Warsaw radio mast, the tallest man-made object ever built before the erection of Burj Khalifa collapsed as consequence of an error in exchanging the guy-wires on the highest stock. The mast first bent and then snapped at roughly half its height. It destroyed at its collapse a small mobile crane of Mostostal Zabrze. As all workers left the mast before the exchange procedures, there were no fatalities, in contrast to the similar collapse of WLBT Tower in 1997. Design change on the Hyatt Regency walkways. On 17 July 1981, two suspended walkways through the lobby of the Hyatt Regency in Kansas City, Missouri, collapsed, killing 114 and injuring more than 200 people at a tea dance. The collapse was due to a late change in design, altering the method in which the rods supporting the walkways were connected to them, and inadvertently doubling the forces on the connection. The failure highlighted the need for good communication between design engineers and contractors, and rigorous checks on designs and especially on contractor-proposed design changes. The failure is a standard case study on engineering courses around the world, and is used to teach the importance of ethics in engineering. ^ It has also been called the worst building collapse disaster in the past 10 years within the state of Maharashtra, and the worst in the country in 20 years. ^ a b Scott, Richard (2001). In the Wake of Tacoma: Suspension Bridges and the Quest for Aerodynamic Stability. ASCE Publications. p. 139. ISBN 0-7844-0542-5. ^ "2006 Metro Area Traffic Volume Index Map" (pdf). Mn/DOT. 2006. Retrieved 9 August 2007. Index map for Mn/DOT's 2006 traffic volumes; relevant maps showing the highest river bridge traffic volumes are Maps 2E, 3E, and 3F. ^ Weeks, John A. III (2007). "I-35W Bridge Collapse Myths And Conspiracies". John A. Weeks III. Retrieved 6 August 2007. ^ "2006 Downtown Minneapolis Traffic Volumes" (PDF). Minnesota Department of Transportation. 2006. Retrieved 7 August 2007. This map shows average daily traffic volumes for downtown Minneapolis. Trunk highway and Interstate volumes are from 2006. ^ "U.S. Secretary of Transportation Mary E. Peters Calls on States to Immediately Inspect All Steel Arch Truss Bridges" (Press release). ^ "Update on NTSB Investigation of Collapse of I-35W Bride in Minneapolis" (Press release). National Transportation Safety Board. 8 August 2007. Retrieved 1 December 2007. ^ a b Davey, Monica; Wald, Matthew L. (8 August 2007). Potential Flaw Is Found in Design of Fallen Bridge. The New York Times. Retrieved 9 August 2007. ^ "Two top Thane municipal corporation engineers held for killer cave-in". The Times of India. 10 April 2013. Retrieved 10 April 2013. ^ "Is Municipality as much to blame as builders for Thane building collapse?" IBN. 4 April 2013. Retrieved 5 April 2013. ^ Nitin Yeshwantrao (6 April 2013). "Thane building collapse toll rises to 72, rescue ops end". Times of India. Retrieved 7 April 2013. ^ "Thane: Four-year-old girl recovered from debris opens her eyes". IBN. 7 April 2013. Retrieved 7 April 2013. ^ Associated Press. "Indian police arrest 9 in Mumbai building collapse ." The Times. 7 April 2013. Retrieved 7 April 2013. ^ "Thane building collapse: 74 dead, both builders arrested". Zee News. 7 April 2013. Retrieved 9 April 2013. ^ "Thane building collapse: 9 arrested, sent to police custody". IBN. 7 April 2013. Retrieved 7 April 2013. ^ "Thane building collapse: Two more arrested, TMC begins demolition drive". DNA. 9 April 2013. Retrieved 9 April 2013. ^ "45 killed as building collapses in India (PHOTOS)" RT News 5 April 2013. Retrieved 5 April 2013. ^ a b "Bangladesh building collapse death toll passes 500". BBC News. 3 May 2013. Retrieved 3 May 2013. ^ Sarah Butler. "Bangladeshi factory deaths spark action among high-street clothing chains | The Observer". The Guardian. Retrieved 26 August 2013. ^ "Bangladesh collapse search over; death toll 1,127". Yahoo News. Retrieved 13 May 2013. ^ "Advertise on NYTimes.com Bangladesh Factory Collapse Death Toll Hits 1,021". The New York Times. 9 May 2013. Retrieved 10 May 2013. ^ "Bangladesh Building Collapse Death Toll Tops 500; Engineer Whistleblower Arrested". Huffington Post. 3 May 2013. Retrieved 3 May 2013. ^ "Bangladesh Dhaka building collapse leaves 80 dead". BBC News. 24 April 2013. ^ "80 dead, 800 hurt in Savar high-rise collapse". bdnews24.com. 24 April 2013. Retrieved 24 April 2013. ^ Mullen, Jethro (24 April 2013). "Bangladesh building collapse kills at least 80". CNN. Retrieved 24 April 2013. ^ Nelson, Dean (24 April 2013). "Bangladesh building collapse kills at least 82 in Dhaka". The Daily Telegraph. Retrieved 24 April 2013. ^ Feld, Jacob; Carper, Kenneth L. (1997). Construction Failure. John Wiley & Sons. p. 8. ISBN 0-471-57477-5. ^ Virdi, K.S. (2000). Abnormal Loading on Structures: Experimental and Numerical Modelling. Taylor & Francis. p. 108. ISBN 0-419-25960-0. ^ "NIST's Responsibilities Under the National Construction Safety Team Act". Retrieved 23 April 2008. ^ Bažant, Zdeněk P.; Jia-Liang Le; Frank R. Greening; David B. Benson (27 May 2007). "Collapse of World Trade Center Towers: What Did and Did Not Cause It?" (PDF). 22 June 2007. Department of Civil and Environmental Engineering, Northwestern University, Evanston, Illinois 60208, USA. Structural Engineering Report No. 07-05/C605c (page 12). Archived from the original (PDF) on 9 August 2007. Retrieved 17 September 2007. ^ Bažant, Zdeněk P.; Yong Zhou (1 January 2002). "Why Did the World Trade Center Collapse?—Simple Analysis" (PDF). Journal of Engineering Mechanics. 128 (1): 2–6. doi:10.1061/(ASCE)0733-9399(2002)128:1(2). Retrieved 23 August 2007. ^ M. Levy; M. Salvadori (1992). Why Buildings Fall Down. Norton & Co.
Feld, Jacob; Carper, Kenneth L. (1997). Construction Failure. John Wiley & Sons. ISBN 0-471-57477-5. Lewis, Peter R. (2007). Disaster on the Dee. Tempus. Petroski, Henry (1994). Design Paradigms: Case Histories of Error and Judgment in Engineering. Cambridge University Press. ISBN 0-521-46649-0. Scott, Richard (2001). In the Wake of Tacoma: Suspension Bridges and the Quest for Aerodynamic Stability. ASCE Publications. ISBN 0-7844-0542-5.